Castle Burn – RTS Revolution is now officially out for Android on Google Play Store. The game has plenty of game modes to keep the player busy all the time and the reward system is also decent. And you need to use the best strategy in order to beat the opponent. In this post, we have covered everything about the game you need to know: – Castle Burn guide and Castle Burn cheats, tips & tricks to master the game. Basics – How To Play Castle Burn Game? The very first step you have to do in Castle Run game is; build the mana sanctum on top of a mana spring to collect mana. Mana is used to deploy units or build towers or camp. And the camp is used to expand the territory; you can deploy units within the territory only. To add the units, tap the + icon(deck slot) and choose the card; unit or spell. It costs you mana. Read the guide part below to learn about the cards and tiers. Along with these units, you can also deploy a hero; the player can change the hero before the battle. There is also a return option in the battle that is used to call the units back. For example; you deployed the archers in the battle. If you want to call them back, select the archer unit in the deck and then tap the return option. There is one objective; destroy the enemy’s castle and protect your own. After the victory, the game will reward you trophies, chests. After gaining a certain number of trophies, you will get promotion and reach the new league. So this is the basic Castle Burn guide for the beginners. Now, let’s head over to the Castle Burn ultimate guide and then tips, cheats & tricks. Heroes are the main characters in Castle Burn game. You can choose up to 1 hero at a time. And in the battle, you can deploy it at any time. If the hero gets died, then you will have to wait a certain amount of time in order to deploy it again on the battlefield. How to obtain more heroes? Open the chests and uncover the castle cards; you get the heroes from these chests. You may get the duplicate hero card from the chest; use it to upgrade the hero. Tier 1<Tier2<Tier 3. It means tier 3 units are more powerful than the tier 1 & tier 2 units. In the battle, you can not deploy the tier 2 or tier 3 units directly; you need to unlock the tier 2 first and then tier 3. And how to do that? It’s very simple; all you need to do is upgrade the castle in the battle. Keep in mind that it would not upgrade instantly; once you add the cards, the upgrade process will start. The spell is used to destroy the group of enemies instantly or to deal massive damage to a group of enemies. And units are movable characters, attack the enemies automatically. And each unit has a different target. For example; Ogre is a ground unit and targets buildings & towers only(this unit does not attack the enemy’s units). A berserker targets ground units only. So make sure to know about the units you have. So this is the Castle Burn guide for the beginners. Now, let’s take a look at the Castle Burn cheats, tips & tricks to master the game. In the battle, we can add up to 6 cards to the deck. And as you know, tier 2 units and tier 3 units are more powerful than tier 1 units. So we would recommend you not to add more than two cards of tier 1. It would be better to choose one tower and one unit from tier 1. After adding two cards to the deck, the castle will be upgraded to tier 2 and you will be able to add tier 2 cards to the deck. So make sure to choose two good attacking units from tier 1(because their mana cost is low). Mana is used to deploy units, tower, spells, camp, and mana sanctum. If the mana production is so slow, then it will be hard for you to deploy high-tier units as they have a high mana cost. Here’s how you can increase the mana production: – Deploy the camp on the battlefield to expand the territory and capture as many mana springs as you can. 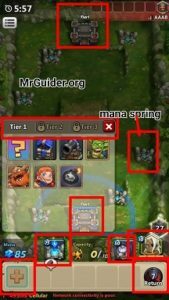 Move the mana sanctum on the top of mana spring to produce mana. Upgrade the castle’s tier. Check their target; ground or air or tower or buildings? Castle Burn game also features the practice mode in which you can train yourself for the ranked match battle. And it is one of the best ways to know about the units, spells, and heroes’ skills. You will not lose trophies in this mode. Go to the adventure mode screen -> practice battle -> select difficulty; normal, easy, beginner -> start. Path of the adventure -> Play this mode to earn gold. Mist Rock Campaign -> In this mode, you battle against other players to top the leaderboard. Here’s how it works; create a deck by choosing desired cards, defend the castle, defeat the waves of enemies, and increase the rank. At the end of the season, you will get rewards. First, select the card you want to convert(keep in mind that you can convert only extra cards); tap the card -> choose; convert from. After it, tap the card you want to get -> choose; convert to. Once done, hit the confirm button. After a certain amount of time, you will get the cards. It is one of the best ways to get the desired cards in Castle Burn game. Make sure to use useless cards for the conversion. Unlike other games, In Castle Burn game, it’s very easy to obtain premium currency; rubies. We would recommend you to use rubies to buy the premium card pack from the shop; alchemist’s card pack. This pack contains rare cards and it costs you 120 gems. Rest packs are too expensive. Go to the shop -> goblin shop section -> lucky roulette -> spin wheel -> get the reward. You can spin it for free by watching a video ad. Spin it 10 times to get free rubies. Some units are weak and strong against specific units. If you deploy the strong units against the enemy’s units, then you will get the advantage. How to know unit’s affinity? Go to the castle tab -> at the top, tap the cards option -> go to units tab -> tap the unit -> tap the affinity button to check. For example; Archer is weak against Viking, Griffin rider, shield mouse, but strong against the goblin, bomber mouse, airship, and more.